About 10 years ago, it was incredibly cool to call yourself a ‘social media consultant’. Social media in a business context was new and exciting (and in too many ways still is 10 years later), and those that marketed themselves as social media consultants were coveted. Yet even as social media consultants were enjoying popularity, a few were sounding potential alarms. Eventually, the market would mature, and companies would need more specialized skills from their consultants. Over time, this has indeed happened. Companies no longer need to hire as many social media consultants and agencies as they once did, now they hire employees and conduct much of their social media and digital strategies in-house. 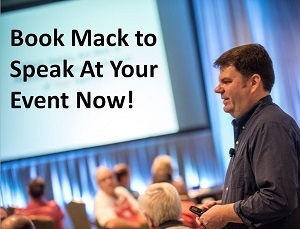 Social media consultants have gone from being generalists to more specialized. In the last few years we’ve seen the rise of specialized social media positions in analytics, content creation, and community management, among others. As the market matures, needs become more specialized. The same thing is beginning to happen with Influencer Marketing. I first started working with clients on influencer campaigns in 2010. Then, the rationale for picking influencers was simply ‘biggest number wins’. Sure, it was best if we could connect with influencers in the specific industry that was relevant to the campaign, but if not, any influencer with a few hundred thousand followers on Twitter would do. I tried my best to explain to these clients that it wasn’t about the overall numbers, it was about how connected and influential the influencer truly was over their followers. The smart clients understood this, and their campaigns were successes. Two interesting stats that dovetail: digital ad spending is set to hit $100 Billion by 2020, while at the same time, ad-blocker usage spiked by 34% since 2015, with 70 million Americans now blocking online ads. This is another reason why Influencer Marketing is so appealing to many brands. Consumers are increasingly distrustful of any advertisement. Influencers give marketers the ability to reach an audience through a more trusted source: The influencer. Instead of running ads on a blog that will be ignored, a brand can instead partner with the blogger directly to have them create original content that promotes the brand. Ideally, the influencer will be smart enough to create the content in a way that creates value for both the brand, and the influencer’s audience. Unfortunately, that doesn’t always happen. Companies that invest in influencer marketing are often seeing nebulous results that are difficult to distill any meaningful value from. Some of this is due to poor planning and execution, as well as partnering with influencers that either weren’t a good fit for their campaign, or who didn’t perform as necessary. Now that we’ve moved past the ‘shiny object’ stage of Influencer Marketing, companies that are still investing in this tactic are increasingly demanding real results for their dollars. As they should. With this, comes re-examining how influencers are chosen. The idea that ‘biggest follower count wins’ is being challenged. Companies are realizing that if an influencer has a big follower count, that just means they have little connection with any of them. And the whole idea behind Influencer Marketing is that brands want to work with people that will influence behavior. If an influencer has little sway over her audience, then it really doesn’t matter if that audience is 100 or 100,000. In fact, what many brands are beginning to realize is that smaller followings typically mean an influencer has more influence over their audience. The reality is, authentic, personal engagement cannot effectively scale past a certain point. The one-to-one interactions that build trust and result in one person having true influence over the actions of another require a lot of attention. If an influencer has a following of 100,000, it’s frankly impossible for them to have enough time to have personal interactions with even a fraction of that audience. Which is why T-Shaped Influencers are suddenly in demand by brands. 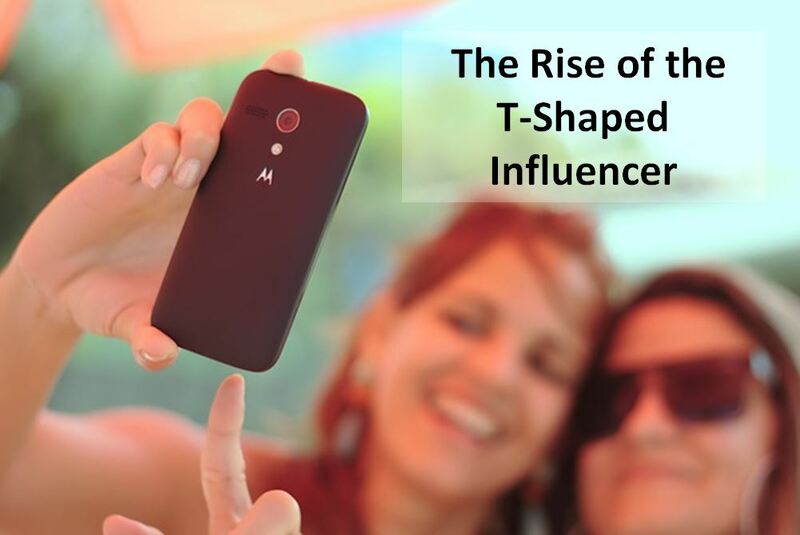 T-Shaped Influencers are influencers that have a narrow focus and following, but a deep connection with that audience. The audience they have influence over is highly specialized, but if they have a connection with the audience you want to reach, it makes more sense from a brand perspective to connect with a T-Shaped Influencer instead of someone with a much larger following, that really has little influence over any of them. Think of it this way: The traditional influencer with a large following typically has a connection with a lot of people, but a DEEP connection (the type that results in true influence) with only a few people. So their influence footprint would be wide and shallow. On the other hand, a T-Shaped Influencer has a very narrow area of people they influence, but their level of influence over that small group is very DEEP. So if you wanted to connect with the small group that the T-Shaped Influencer has a connection with, it makes more sense to work with them versus working with the ‘traditional’ influencer that has a large following, but a loose connection with that following. 1 – Tim, the generalist influencer. Tim has a following of 350,000 on Twitter and Instagram. He is focused on business and technology, so there’s some overlapping between electronics and hybrid cars. On average, he charges $350-$700 for an Instagram post or blog post. 2 – Sarah, the T-Shaped Influencer. Sarah has a following of only 5,000 on Facebook and Instagram. But approximately 90% of her following are people that are highly interested in automotive information. On average, she charges $25-$60 for a Facebook update or Instagram post. While Sarah has a much smaller following, she also has an audience that’s far more relevant to a brand that’s launching a hybrid sports-car. Another beneficial byproduct of Sarah’s smaller following is that she can have much higher levels of engagement with that smaller following. In fact, when it comes to engagement when working with influencers, smaller number wins. Influencers on Instagram with a following under 1,000 saw over 15% engagement on their posts, whereas influencers with a following of over 100,000 saw their engagement rates fall to 2.4%. Years ago, an agency contacted me because they wanted to launch an influencer campaign to support a new offering from a client. The agency had already built a list of a few candidates, and they wanted me to see if I could come up with a few more possible influencers to round out their list. Remember this is long before Instagram and Snapchat, in fact Twitter and Facebook were much smaller. The agency was primarily wanting to see content created on blogs, and promoted on social media. “Go look at her blog”, I explained. While she did indeed only have a few thousand followers on Twitter, every post she wrote had engagement that was off the charts. Each post had 50 or so comments, and half were from the blogger. Her readers loved her, and she loved them. Thankfully, they decided to shift their Influencer Marketing approach away from big numbers, to a more T-Shaped Influencer model. The agency picked influencers that had a smaller following, but a deeper connection with a specific audience. And as an aside, this approach led to results that surpassed all goals the agency had set for the campaign. Your brand should do the same with your Influencer Marketing campaigns. Seek out T-Shaped Influencers that have a smaller following, but a deeper connection to a specific audience. Remember, you want to work with people that will influence behavior in your favor. Bigger isn’t always better. This is really about Tier 1, 2, and 3 “influencers” – and share of voice vs. revenue types of decisions. Niche is gaining more and more importance in the ability to “stand out” (if that’s even possible anymore) – However I’d question any “influencer” who influences to the tune of “dollar per post/picture” – if they’re getting paid to pitch, then they’re more like ambassadors – and we know how useful those are to sales & revenue…Even for the small sums mentioned, I’d argue that these folks are tainted. Great post. What’s the best way to find these types of influencers? Are there platforms or other search tools that help identify a t shaped influencer in any given niche? Hey Ryan! Any tool that can give you insights into engagement and/or do a content analysis should be helpful. Remember that you’re looking for influencers with a smaller following (like a micro-influencer), but also one that has a deep level of influence in a particular space or industry. For example, one of my hobbies is car detailing, and I am very much a novice. So in doing research, I started identifying the best sites/forums where I could learn more about which products are best, how to use them, etc. I started asking about one particular line of products, and everyone said ‘Ask Ron about that, he’ll know’. Everyone agreed that ‘Ron’ was the expert about how to use this one particular brand’s products. I checked and I don’t think ‘Ron’ is even on any social media sites, but if I wanted to connect with influencers that use this one brand’s products, ‘Ron’ is who I’d want to connect with, because even though he has a small following on social media, he is HIGHLY influential among a small group of people that are extremely passionate about detailing and detailing products. That’s exactly what you want, to connect with influencers that have smaller followings so they can connect personally with more people, and in a very tightly defined niche or space. Those are T-Shaped Influencers. There used to be a tool called LittleBird but it’s been acquired by Sprinklr so Lord knows where that’s at now but they were quite effective in my experience.